AN UNMATCHED DIVERSITY OF RED MEATS IN WHOLEPREY™ RATIOS TO MIRROR THE EVOLUTIONARY DIET OF CATS. 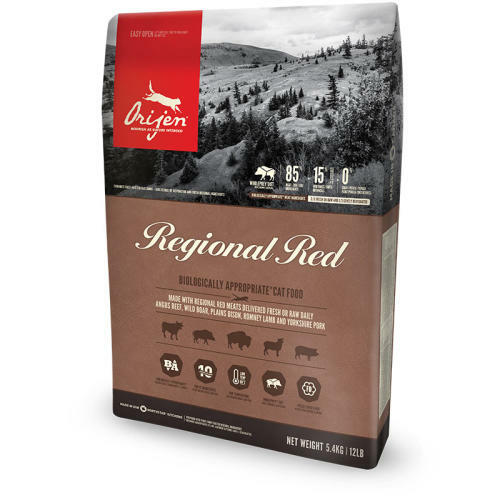 ORIJEN REGIONAL RED is packed with Angus beef, wild boar, Plains bison, Romney lamb and Yorkshire pork, raised on Alberta ranches, delivered FRESH or RAW, and incorporated in WholePrey™ ratios that nourish your cat completely. Using regional ingredients such as Heritage Pork from Sturgeon Valley Alberta, Black Angus Beef from Vegreville Alberta and fruit and vegetables from British Columbia source only the highest quality ingredients and delicious sources of fresh meat which naturally help maintain your cat in optimum health.